If you spend any time in the “debate” (actually, one side has scientific evidence and the antivaccination side denies all science, so to avoid falling for a false equivalency, debate gets scare quotes), you’ll hear every dumb argument to deny science. But one thing that you’ll see repeatedly from the vaccine deniers is that they would support vaccinations if there were better clinical trials. The problem with the vaccine denier’s clinical trial proposals is that they are a moving target, relying on a form of the Argument from ignorance, claiming that if we can’t absolutely “prove” that vaccines are safe, then it must be absolutely unsafe. For example, there are dozens of articles, including one of the latest (published here and discussed here). 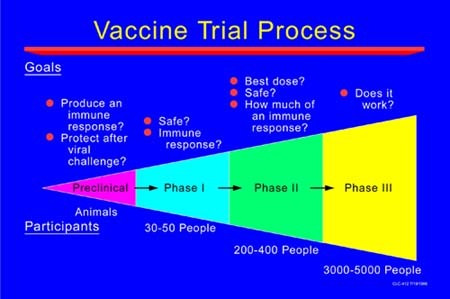 The actual process for vaccine clinical trials. 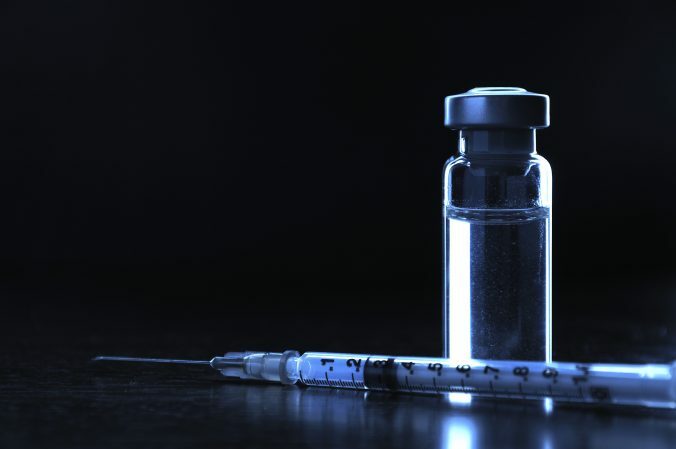 My good friend Allison Hagood, co-author of Your Baby’s Best Shot: Why Vaccines Are Safe and Save Lives , wrote a commentary about the antivaccine community’s perfect clinical trial. Follow along! (Allison’s commentary is presented in whole, but I’ve edited the formatting and added links where necessary). Multiple studies in multiple countries using multiple research models and multiple research groups, with multiple funding sources, have found no link between vaccines and autism. This is also true for a link between vaccines and ADHD, asthma, diabetes, autoimmune disorders, and the various other conditions that anti-vaccine propagandists attempt to link to vaccinations. Every one of these studies has been dismissed by those anti-vaccine propagandists as having the wrong funding source, the wrong research design, the wrong focus, not separating out antigens from other vaccine ingredients, separating antigens from other vaccine ingredients inappropriately, not testing this, or that or something else. The anti-vaccine movement wants ONE study. The One Study To Rule Them All. The One Study that tests every possible aspect of every vaccine. This is basically what the AVers are asking us to do. 1. Eliminate the use of all vaccines immediately in every country on the planet. Immediately. Regardless of any public health issues currently in existence. 2. Randomly sample an acceptable number of children for each experimental and control group for each group discussed below. The numbers in each group would need to be in the hundreds or thousands to satisfy statistical requirements for validity and significance, and would have to include children from every country, every ethnicity, every socio-economic status, with every possible genetic combination from parents, and of every possible health history based on parental family health. Anti-vaccine propagandists have rejected studies with 3000 or more subjects, so each group below would need to contain huge numbers in order to satisfy them. But then again, many of them accept 12 subjects (the number in Andrew Wakefield’s fraudulent study) as valid, so who knows? Anti-vaccine propagandists are fond of saying “there are plenty of unvaccinated kids already, just use them!” You cannot use pre-existing groups who selectively vaccinate or do not vaccinate at all, because research has shown that these parents have certain differences from other parents, and those pre-existing differences would be a confounding variable in the study. To do a credible study of the kind that the anti-vaccine propagandists are demanding, you MUST randomly sample children, and then you MUST randomly assign them to the groups below. Parents would have no choice about this. 3. Obtain permission from parents of children in each group to administer an injection into their child. The parents and children will not know what injection the child is receiving. The parents would not be allowed to have their children receive any injection from any other source, to avoid contamination of the data. Some children in the study would be completely unprotected from any disease outbreak, and their parents would be unaware of whether or not the children were unprotected. • Just the antigen, in saline. • Just saline. This comparison (or control, in scientific terms) group would be necessary for every single group involved in the study. No one in this group would receive any aspect of any vaccine ever, just injections of saline. • Just one ingredient of the vaccine (i.e., formaldehyde), in saline. So, starting with the first ingredient on the list, we’d have to have a group that received every single vitamin injected, every single vitamin in combination with every single other vitamin, in combination with multiple of the other vitamins, etc. Let’s say there are four different vitamins (A, B, C, D). We’d have to have an A only group, a B only group, a C only group a D only group, an A/B group, an A/C group, an A/D group, a B/C group, a B/D group, a C/D group, an ABC group, an ABD group, an ACD group, a BDC group, and an ABCD . That’s 15 comparison groups for four ingredients. Then, we’d have to have a group for each vitamin in combination with each other ingredient – vitamin A combined with sucrose, B with sucrose, D with sucrose, etc. Then we would have to test each other ingredient in various combinations with other ingredients. Again, thousands of groups, each having hundreds or thousands of children to cover all combinations mentioned above. The above breakdown of possible combinations would have to be repeated for every vaccine, for every booster, and for every possible combination of boosters. 5. Follow every single child in every single group throughout the course of their entire lifetime (which, with current life expectancy, can be 70-80 years in developed countries), monitoring every medical/health condition that develops, and comparing those rates for each and every group above. If a single of the thousands of study groups lost a single participant (through moving, withdrawal, death, etc. ), the Avers would declare the entire study null and void, even though such attrition is to be expected, and is controlled for in the study design. 6. Compare each group above for every possible illness or medical/health condition. 7. For each and every group mentioned above, we’d have to create a control group in which the children received no injection at all, of anything. No saline, no antigen, nothing. 8. Remember that the anti-vaccine movement wants each vaccine tested individually, THEN in combination. So, we’d have to have one generation of children receiving the above breakdown of ONE vaccine over an entire lifetime, then another generation of children receiving the above breakdown of ANOTHER vaccine over an entire lifetime, etc., until all vaccines have been tested individually. Then and only then do we start testing vaccines with boosters. Then after that, vaccines in combination, but only two at a time. Then three at a time. This requirement would mean that the study that would fit the criteria demanded, the One True Study, would last until approximately the heat death of the sun. This doesn’t even get into the ethics of the various groups, the sampling difficulties, or the enormous amounts of money that would be required (money that could not come from any government, any governmental agency, any institution of higher education, or any scientist who’s ever done vaccination research in their career). At this point, it should be apparently that such a study is not possible. Various studies have addressed various aspects of each of the embedded questions in the above scenarios, and in combination, those answers address the concern of the anti-vaccine movement. For example, one ingredient used in vaccines are aluminum salts (not elemental aluminum, as is claimed). These are used as an adjuvant, to create a stronger immune response so that less antigenic material is required. The safety of these adjuvants has been well established. That’s just one meta-analysis of the studies of the safety of one ingredient. It’s not part of The One Study that anti-vaccine propagandists want, though, so they reject it. Think of the studies as a jigsaw puzzle. The puzzle isn’t one piece. It’s many pieces that fit together, making a total picture. The total picture on vaccinations is that they are safe and save lives. Science isn’t about The One Study. It’s about ALL the studies. Ahmed SS, Plotkin SA, Black S, Coffman RL. Assessing the safety of adjuvanted vaccines. Sci Transl Med. 2011 Jul 27;3(93):93rv2. doi: 10.1126/scitranslmed.3002302. Review. PubMed PMID: 21795590. Andrews N, Miller E, Grant A, Stowe J, Osborne V, Taylor B. Thimerosal exposure in infants and developmental disorders: a retrospective cohort study in the United kingdom does not support a causal association. Pediatrics. 2004 Sep;114(3):584-91. PubMed PMID: 15342825. Demicheli V, Rivetti A, Debalini MG, Di Pietrantonj C. Vaccines for measles, mumps and rubella in children. Cochrane Database Syst Rev. 2012 Feb 15;2:CD004407. doi: 10.1002/14651858.CD004407.pub3. Review. PubMed PMID: 22336803. Destefano F, Price CS, Weintraub ES. Increasing Exposure to Antibody-Stimulating Proteins and Polysaccharides in Vaccines Is Not Associated with Risk of Autism. J Pediatr. 2013 Mar 29. doi:pii: S0022-3476(13)00144-3. 10.1016/j.jpeds.2013.02.001. [Epub ahead of print] PubMed PMID: 23545349. Gerber JS, Offit PA. Vaccines and autism: a tale of shifting hypotheses. Clin Infect Dis. 2009 Feb 15;48(4):456-61. doi: 10.1086/596476. Review. PubMed PMID: 19128068; PubMed Central PMCID: PMC2908388. Godlee F, Smith J, Marcovitch H. Wakefield’s article linking MMR vaccine and autism was fraudulent. BMJ. 2011 Jan 5;342:c7452. doi: 10.1136/bmj.c7452. PubMed PMID: 21209060. E. Allison Hagood; Stacy Mintzer Herlihy; Paul A. Offit (foreword) (2012). Your Baby’s Best Shot: Why Vaccines Are Safe and Save Lives. Lanham, Md: Rowman & Littlefield Publishers.ISBN 1-4422-1578-X. Jefferson T, Rudin M, Di Pietrantonj C. Adverse events after immunisation with aluminium-containing DTP vaccines: systematic review of the evidence. Lancet Infect Dis. 2004 Feb;4(2):84-90. Review. PubMed PMID: 14871632. Next PostNext Do GMO crops have a higher yield? It depends on the answer.